Neil Armstrong, the first man to walk on the moon, poses for his NASA portrait ahead of his historic Apollo 11 mission in July 1969. Astronaut Neil A. Armstrong, who in 1969 took a "small step" to become the first human to set foot on the moon, has died at the age of 82. Armstrong, who described his first steps on the lunar surface as a "giant leap for all mankind," died on Saturday (Aug. 25). He had undergone coronary bypass surgery on Aug. 7, two days after his 82nd birthday. Armstrong's death was confirmed in a statement by his family. 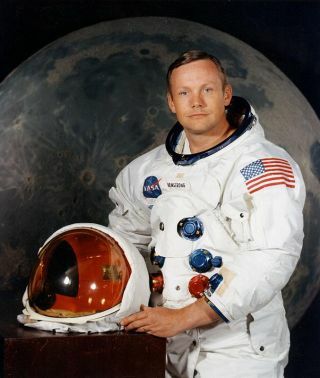 "Neil Armstrong has passed away following complications resulting from cardiovascular procedures," his family wrote on the website neilarmstronginfo.com. "Neil was our loving husband, father, grandfather, brother and friend." Commander Neil Armstrong (right) and pilot David R. Scott prepare to board the Gemini-Titan 8. Gemini VIII successfully launched at 11:41 a.m. EST, March 16, 1966. The mission conducted the first docking of two spacecraft in orbit and landed safely back on Earth after an emergency abort. But the flight was a near disaster, suffering the first critical in-space failure of a U.S. spacecraft after a stuck thruster set the Gemini spacecraft spinning. Armstrong ultimately regained control by using their re-entry system thrusters, steadying the spacecraft and forcing an early, but safe end to the mission. Three years later, as spacecraft commander for Apollo 11, the first manned lunar landing mission, Armstrong gained the distinction of being the first man to land a craft on the moon and the first to step on its surface. "He was the best, and I will miss him terribly," Apollo 11 command module pilot Michael Collins said in a statement released by NASA. Armstrong's first words upon becoming the first person to step onto another planetary body on July 20, 1969 — "That's one small step for (a) man, one giant leap for mankind" — instantly became a part of history. Together with lunar module pilot Buzz Aldrin (then Edwin Aldrin), Armstrong explored the Sea of Tranquility during a 2 hour, 36 minute moonwalk. He and Aldrin collected 48.5 pounds (22 kilograms) of lunar material, including 50 moon rocks, deployed science experiments and planted the U.S. flag. A plaque attached to their lunar lander "Eagle" read in part "We came in peace for all mankind," which underscored that Armstrong and Aldrin were there as representatives of all humans. "Neil will most certainly be there with us in spirit," he said. On July 20, 1969, Apollo 11 astronaut Neil Armstrong became the first man to walk on the moon. Armstrong is pictured here, shortly after collecting a sample of lunar dust and rocks. At his feet is the handle for the sample collection tool. Soon after returning from the moon, Armstrong announced he would not fly in space again. "Neil Armstrong was also a reluctant American hero who always believed he was just doing his job," his family said in their statement. "He served his nation proudly, as a navy fighter pilot, test pilot, and astronaut. He also found success back home in his native Ohio in business and academia, and became a community leader in Cincinnati." Following his return from the moon and the world tour that followed, Armstrong served at NASA Headquarters as the deputy associate administrator for aeronautics, managing the agency's overall aviation research and technology. He resigned from NASA a year later in 1971 and accepted a position as a professor of aerospace engineering at the University of Cincinnati, a role he served through the end of the decade. From 1982 through 1992, Armstrong was chairman of Computing Technologies for Aviation, Inc., in Charlottesville, Va.
Born in Wapakoneta, Ohio, on August 5, 1930, Armstrong earned a bachelor of science in aeronautical engineering from Purdue University in Indiana and a Master of Science in aerospace engineering from the University of Southern California. He was later awarded honorary doctorates from a number of universities. Following three years as a naval aviator, Armstrong joined the National Advisory Committee for Aeronautics (NACA), the predecessor to NASA, in 1955. His first assignment was with the Lewis Research Center (now NASA Glenn) in Cleveland. As a research pilot at NASA's Flight Research Center in California, Armstrong served as a project pilot on many of the nation's pioneering high performance aircraft, including the X-15 rocketplane. He flew over 200 different models of aircraft, including jets, helicopters and gliders. Armstrong was a fellow with the Society of Experimental Test Pilots and the Royal Aeronautical Society; honorary fellow of the AIAA (American Institute of Aeronautics and Astronautics), and International Astronautics Federation. He was a member of the National Academy of Engineering and the Academy of the Kingdom of Morocco. He served as a member of the National Commission on Space (1985-1986), as Vice Chairman of the Presidential Commission on the Space Shuttle Challenger Accident (1986), and as Chairman of the Presidential Advisory Committee for the Peace Corps (1971-1973). NASA test pilot Neil Armstrong is seen here next to the X-15 ship #1 after a research flight. Armstrong was decorated by 17 nations and was awarded many special honors, including the Presidential Medal of Freedom; the Congressional Space Medal of Honor; the Explorers Club Medal; the Robert H. Goddard Memorial Trophy and the NASA Distinguished Service Medal. He was also bestowed with the Harmon International Aviation Trophy; the Royal Geographic Society's Gold Medal; the Federation Aeronautique Internationale's (FAI) Gold Space Medal; the American Astronautical Society (AAS) Flight Achievement Award; the Robert J. Collier Trophy and the AIAA Astronautics Award. Armstrong received the Octave Chanute Award and the John J. Montgomery Award. In 2011, Armstrong and his Apollo 11 crewmates received the Congressional Gold Medal, the highest civilian award bestowed by Congress. "For those who may ask what they can do to honor Neil, we have a simple request," his family wrote. "Honor his example of service, accomplishment and modesty, and the next time you walk outside on a clear night and see the moon smiling down at you, think of Neil Armstrong and give him a wink." Armstrong is survived by his wife, two sons, a step son and step daughter, ten grandchildren, and a brother and a sister. This story was updated at 8:18 p.m. ET.